I first came across ToNick at the All Time Low concert in Hong Kong last year, when they were opening for their Baltimore pop-punk counterpart. Not knowing the band myself (yes yes yes, I live under a rock), to say I was mildly surprised at the number of teens in the audience singing along and bobbing their heads enthusiastically is an understatement. When I did a quick Facebook search back home, I realized that this band had garnered tens of thousands of fans; that, coupled with the energy-pumped live performance they gave at The Underground festival that got the crowd going wild, all convinced me of this: in the local canto indie band scene, ToNick is the next big thing. 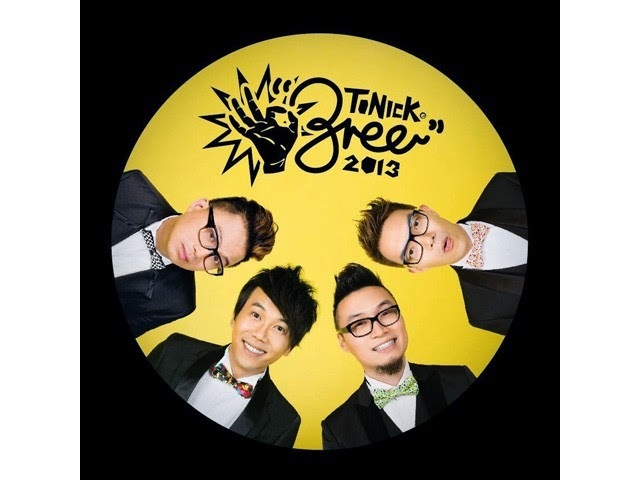 ToNick has a very unique sound to them, one that demonstrates talent on par with the best of pop punk – think Good Charlotte and Simple Plan – while winning over the hearts of the local audience by injecting sometimes comical yet highly relatable commentaries on the everyday life of a HongKonger. Their new album, 3ree, is a manifestation of this point. Don’t be fooled by the Disney-esque “intro”; the rest of the album is nothing like this piece which feels like opening theme to an epic fantasy film (think LOTR). The first song, 一, beginning with a 30STM-like intro, weirdly transitions into a chorus which I feel is the weakest part of the song, being slightly out of place with the original darker tone and power-fueled instrumentals in the background; against my will I am also reminded of the 90s hit 一人有一個夢想. But if the chief aim of the song is to be motivational, it has definitely achieved its purpose, and has all of the vigor of youth – “熱血一爆發” indeed. “趕客” has a slight Escape The Fate sound to it, and the lyrics perfectly capture the essence of Hong Kong’s pointlessly hectic lifestyle; the guitar riffs in the song also showcases very good songwriting skills. 水滾茶靚 asks – “香港地點解咁古怪?” while going on to point out the eccentricities of our traditions and everyday behavior through the creative use of colloquial expressions and realistic dialogue of exchanges. Musically, though the hook was catchy and overall the electric guitar added on to the fun vibe of the song, it was a little too poppy sounding for my liking, and memorable in the slightly annoying way that reminded me of 森美移動 on the radio years ago. From track 5 onwards, the album shifts away from commentaries to songs about love; the sixth song, 血洗情人節 – literally “Bloody Valentine” – features scream vocals in the metalcore tradition, and the musical style was reminiscent of that of A7X, Disturbed, and Five Finger Death Punch. This easily made it my favourite song out of the bunch, but I felt that what could have been a great song was compromised by the use of colloquial Cantonese, which was (in my opinion) too playful in nature. In terms of overall consistency, 你對我已經唔係以前咁 was the best in blending heartfelt vocals with classic pop punk melodies, incorporating creative tick tock sounds of the clock in the background that works to its effects. 異相 easily has the catchiest chorus and in a typical rebellious punk fashion, tells everyone it’s okay to be weird. The last song, 3free, is also the title track; it’s the quietest song out of the bunch, and the emotions shine through in its entirety. As it moves on to the heavier part of the song, it nicely wraps up the album with the best elements of ToNick’s sound: highly relatable lyrics, a pinch of local flavor, memorable chorus, and fun guitar riffs. Overall, it’s easy to see where ToNick’s appeal lies – the fearless embracing of the local culture in its lyrics speaks to every HongKonger, while the light-hearted musical boost gets you pumped up for the day ahead. If that sounds like something you’ll be a fan of, 3ree’s the CD to watch out for.